Our application process is the same for domestic and international students as SSAT scores are required and must be submitted as part of the application file. In addition, international students whose primary language is not English are required to take the TOEFL. Please feel free to contact us if you have questions. Q. How much is the international student application fee? The international student application fee for Church Farm School is $100 USD. Q. Does Church Farm School require international applicants to submit an SSAT score report? An SSAT exam taken within the past year is required for all applicants regardless of citizenship and native language. Score reports must be sent directly from SSAT, we cannot accept copies sent by schools or consultants. Q. Does Church Farm School offer an ESL program? No, Church Farm School does not offer an ESL program. All international students are expected to be highly proficient in reading, writing and speaking the English language before they can be considered for admission. Q. Does Church Farm School require international applicants to submit a TOEFL score? For non-native English speakers, a TOEFL exam taken within the past year is required. Please note: Church Farm School does not accept the SLEP, IELTS or the TOEFL Junior tests. TOEFL score reports must be sent directly from ETS; we cannot accept copies sent by schools or consultants. Q. What are Church Farm Schools' test codes? Our SSAT code is 2236. Our TOEFL code is 7218. Q. Does Church Farm School offer admission interviews in my area? Our Admission Officers do travel around the US and overseas to interview in the fall and winter. Please refer to the admission calendar to see our travel plans for fairs, receptions and interviews. While we believe that a campus visit is always helpful, if you are unable to visit the campus, you may contact us to schedule a Skype interview. Please note, due to high demand, Skype interviews cannot be scheduled prior to the submission of your completed application including SSAT and TOEFL scores. Please contact our office prior to January 15 to request your interview so that we can schedule it prior to January 31. Q. Who is considered an international applicant? Applicants who are not U.S. citizens are international applicants. U.S. citizens employed overseas who file U.S. tax returns are not considered international applicants. If you are a dual citizen whose native language is not English, you are still required to take the TOEFL exam. Q. Does Church Farm School issue the I-20 form? Yes, Church Farm School is authorized by SEVIS (US Department of Security’s Student and Exchange Information System) to issue the I-20 application form. Students must apply, be admitted and enrolled before Church Farm School may issue the application. We have approximately 30 international students to whom we issue I-20 forms after they enroll as new students in April. They then provide us with financial certification, parent affidavit and a copy of their passport page. In nearly all cases, our newly admitted students succeed in obtaining student visas. Due to legal regulations, Church Farm School cannot issue I-20’s for enrolled students more than 90 days prior to the start of school. Although Church Farm School is willing to consider applications for financial aid from international students, it is unlikely that aid will be granted. We must caution applicants that our international student financial aid is highly restricted and selective. Church Farm School requires as much income and asset verification as families can provide, including tax schedules, proof of salary, bank statements, property assessments, etc. Additionally, we must caution families that, although we have granted financial aid to a highly selective group of non-US citizens, international student financial aid is extremely difficult to obtain at U.S. colleges and universities. Church Farm School cannot provide fee waivers for the PFS/application to SSS for international students. We encourage online application to SSS to maximize efficiency and likelihood of successful application. If the cost of application to SSS is prohibitive, we will accept copies of all materials sent directly to Church Farm School. 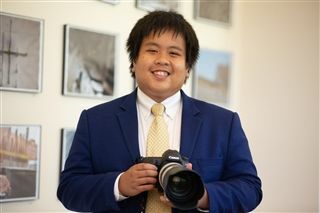 Nam Do '19 is in his final year at Church Farm School, coming to us from a private school in Texas after moving from Hanoi, Vietnam. "My school in Texas had a more homogenous community than this, but I was always interested in other cultures." In addition to appreciating the diversity of the school, Nam has also been able to cultivate his varied interests even more. He is an accomplished writer (this past summer he studied investigative journalism at The School of the New York Times), public speaker (check out his TEDxKids talk on YouTube), photographer, vocalist ... the list goes on and on. “I recently started my own nonprofit, Sing for Joy, with an organization in Vietnam. Students audition, we put them in a choir, stage a performance and the proceeds go to various causes. We raised $30,000 to build a playground at the National Childrens’ Hospital.